We are sisters eight years apart and are very close. We both love writing and several years ago decided to write a trilogy about sisters. Julie had been published for several years and Sandy was just breaking into the field. Julie wrote the first and last book in the series and Sandy wrote the second book and a separate novella about a witch at the Salem Academy for Ladies. Kensington Publishing published the trilogy and the books won several awards. We obtained our rights back a few years ago, refreshed the content, and developed new covers, hoping to reach a new audience. Julie published her first book in 1993. The second book in the MacInness Trilogy, The Seer, originally published in 2002, was Sandy’s first book. 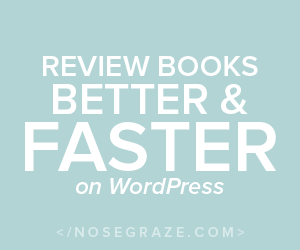 Can you tell me a little bit about your book and what inspired it? We knew we wanted to write a book about sisters and we were fascinated with the Salem witch trials. Sandy actually went to Salem and did research. We discovered a lot of books had been written about the witch trials and set during the trials, but we wanted to put the setting in colonial America, so we set the books 100 years later and focused on their descendants. In 1692, an innocent man accused of witchcraft hangs in Salem, Massachusetts. His death reignites a deadly feud between the descendants of two ancient Scottish clans—MacGow and MacInness, which leaves the MacInness clan descendants cursed. Any man who weds a MacInness is destined to an early death. The MacInnesses have one century to lift the curse and reflect it back upon Clan MacGow. Nearly one hundred years later, triplet sisters separated in childhood, are being drawn back to Salem. 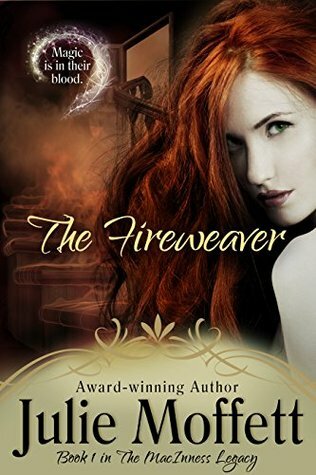 The have three months to refine their unearthly talents of fire, sight, and healing, and break the deadly curse…or lose the men they love forever. What do you hope that readers take way with them after reading your book? We hope readers enjoy the paranormal and magical aspects, while feeling as if you are actually living and walking the streets in colonial Salem. We added lots of action and adventure while keeping it true to the historical period. I find it interesting to know what environment authors find most productive… Do you use a pen and paper or laptop? Quiet room at home or bustling café? Basically, what gets your creative juices flowing? Both Sandy and Julie use laptops and write whenever and wherever they can squeeze in the opportunity. The toughest criticisms usually come from your editor who gives it to you straight up if something isn’t working. I’ve deleted entire scenes, paragraphs, chapters and even characters at some point. But each criticism is a lesson and makes you a stronger and better writer. Julie: On my nightstand is JB Lynn’s hilarious hitwoman series and the next book in Sandy’s aviation action/adventure series, OUTFOXED. Sandy: I’m reading the 8th book in Julie’s humorous geeky mystery series, NO WOMAN LEFT BEHIND. Yes, we read and edit each other’s novels. 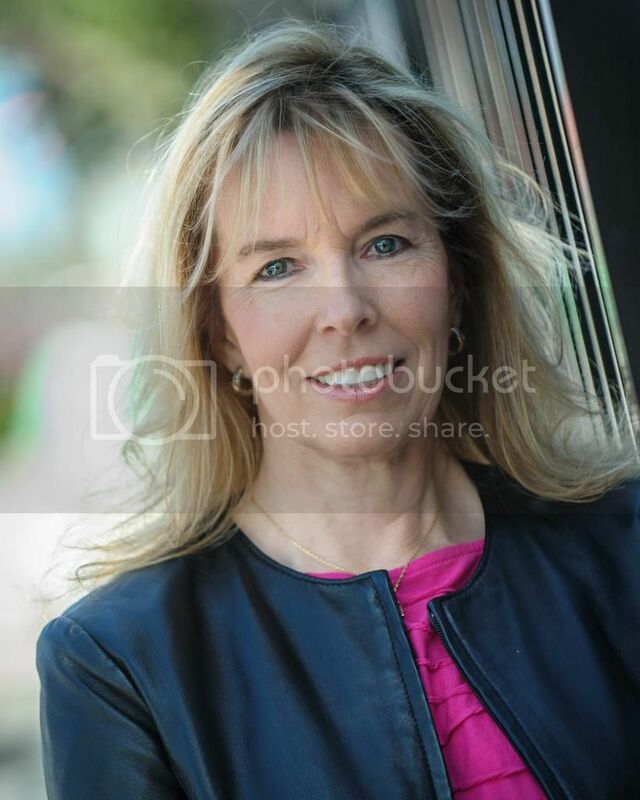 Julie: As a single mom with a day job, novel writing at night, and two kids, there is no other free time!! Ha! Actually, I’m a big reader and I also like to jog and talk long walks. 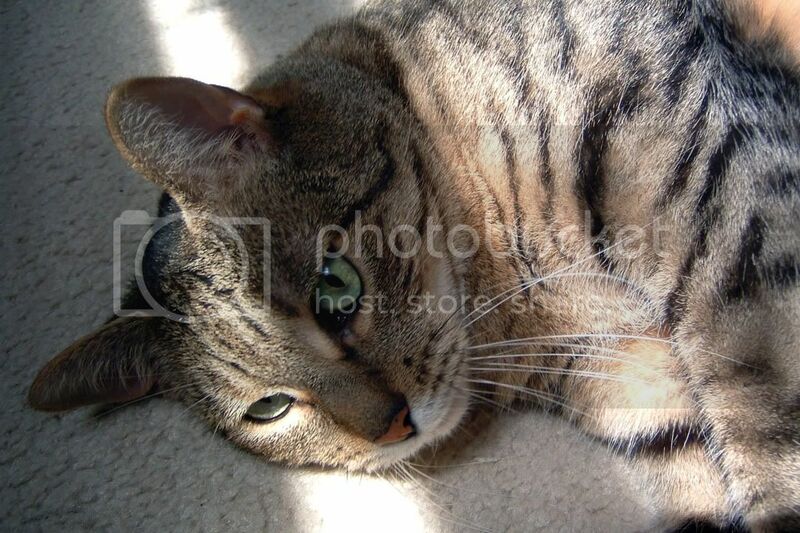 Sandy: I love to travel, work out, and dabble in photography. Never, ever, give up. You don’t know how close to success you may be. Julie: The 7th book in my Lexi Carmichael humorous geeky mystery series titled NO TEST FOR THE WICKED is out December 1st. Sandy: The 2nd book in my action/adventure series, OUTFOXED, will be out soon! Country or City? Julie & Sandy: Beach!! Morning or Evening? Sandy & Julie: Evenings! Trains or Planes? Julie & Sandy: Both! Thank you SO much for the opportunity!!!! In 1692, an innocent man accused of witchcraft hangs in Salem, Massachusetts. His death reignites a deadly feud between the descendants of two ancient Scottish clans—MacGow and MacInness, which leaves the MacInness clan descendants cursed. Any man who weds a MacInness is destined to an early death. The MacInnesses have one century to lift the curse and reflect it back upon Clan MacGow. One hundred years later, triplet sisters separated in childhood, are being drawn back to Salem. The have three months to refine their unearthly talents of fire, sight, and healing, and break the deadly curse…or lose the men they love forever. 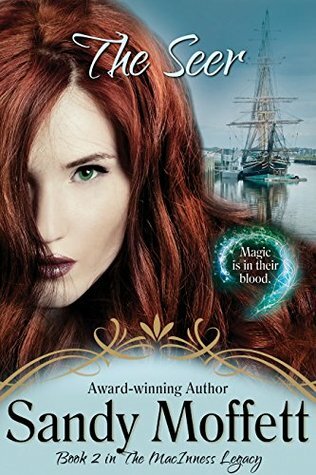 From best selling, award winning author Julie Moffett comes the first book in a historical paranormal romance series about sister witches written with her sister, Sandy Moffett. 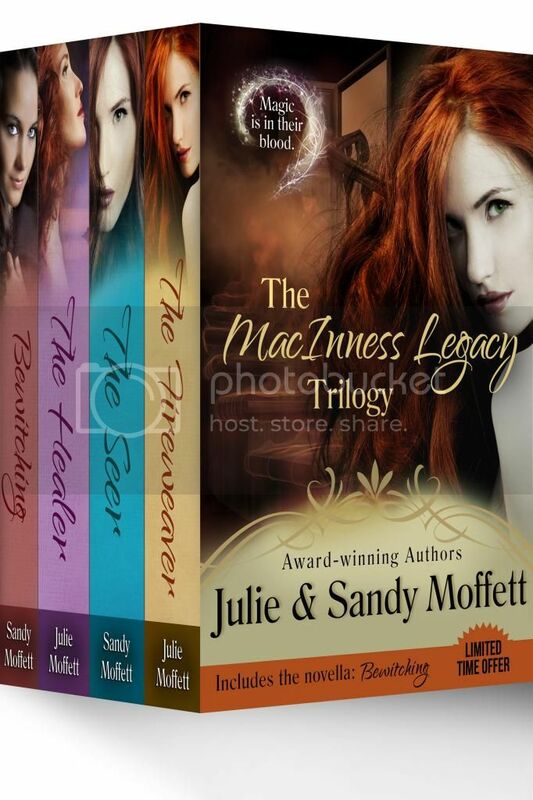 The Seer is the second book in The MacInness Legacy Series, written by sisters Sandy and Julie Moffett. The story garnered Sandy a Lories Award for Best New Paranormal Author. After an innocent man accused of witchcraft hangs in 1692 Salem, his death reignites a deadly feud between the descendants of two ancient Scottish clans—MacGow and MacInness. The peaceful MacInness descendants are left tragically cursed. Any man who weds a MacInness is now destined to an early death. The MacInnesses have one century to lift the curse and reflect it back upon Clan MacGow. One hundred years later, triplet sisters separated in childhood are being drawn back to Salem. They have three months to refine their unearthly talents of fire, sight, and healing, and break the deadly curse…or lose the men they love forever. Alexandra Gables needs no man to run her life. Educated, witty, and wealthy, she is the only child in a family with a long line of prominent scientists. Despite her gender, Alexandra intends to continue that heritage and let no man stand in her way. But her father, anxious for grandchildren, teams up with an old friend whose equally stubborn and brilliant son, Pierce Williams, has no time for a frivolous woman to slow down his life. When Alexandra is sent to Salem to help the elder Williams catalogue and sketch a scientific collection for the Royal Society of London, she has no idea that she is being dangled as marriage material for Pierce. Both are firmly determined to ignore each other, but Alexandra is drawn to Pierce’s quick wit, irresistible charm, and enviable engineering skill. However, close encounters with Pierce trigger an increase in the strange prophetic visions she has had all her life––visions that have no scientific basis or explanation. When a vision reveals the destruction of a ship Pierce designed, built, and will sail on, she must risk a deepening love for Pierce against the loss of his life and all her future dreams. 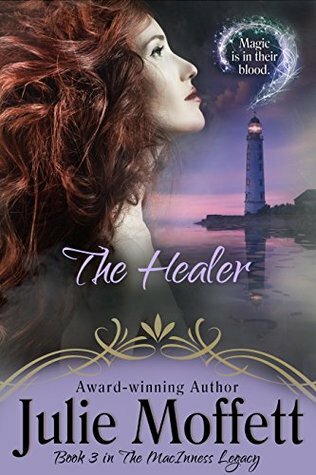 From best selling, award winning author Julie Moffett comes the third book in a historical paranormal romance series about sister witches written with her sister, Sandy Moffett. Gillian is the daughter of a well-known physician Zachariah Saunders and his wife, Mary. Years ago Gillian’s father was accused of improper medical behavior, and the family was ostracized from Salem to the nearby town of Gloucester. There Gillian became her father’s apprentice, learning all she could about medicine, botany and the healing arts. She was frightened, but intrigued, when she discovered she had an unusual ability to heal small, wounded animals by simply touching them. Her strange ability is put to the test when a young and handsome doctor is dragged to her door near death. Gillian makes him well again, but in the process falls hopelessly in love. It is this love that returns her to Salem and brings her face to face with her natural mother and sisters she never knew existed. Now she must overcome her past and help her newfound family work to lift a century-old curse before it destroys the men they love. Multi-award winning author Sandy Moffett brings to life historical Salem in this first novella of a series. The Salem witch trials may be a hundred years past, but Constance Sedgewick and her two aunts run Salem’s Academy for Young Ladies, where any rumor of strange occurrences could ruin their excellent reputation. So when pictures start falling off walls, dishware unexplainably cracks, and odd things start to happen, Constance discovers her strong, arcane powers are taking on a life of their own. When her aunts share the cause, Constance isn’t sure she can withstand the cure. 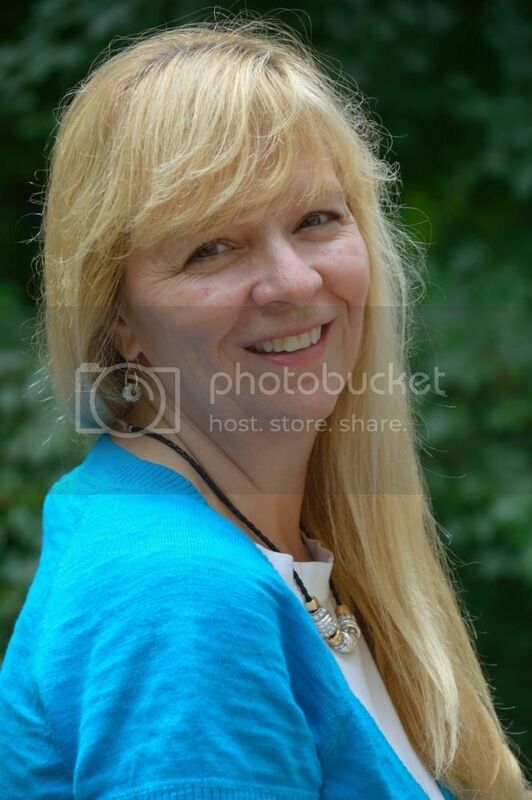 Julie Moffett is the award-winning author of fourteen published novels in the genres of historical, paranormal fantasy, and time travel romances, and action/adventure mysteries. She grew up as a military brat (Air Force) and has traveled extensively. Her more exciting exploits include attending Kubasaki High School in Okinawa, Japan, backpacking around Europe and Scandinavia for several months, a year-long college graduate study in Warsaw, Poland and a wonderful trip to Scotland and Ireland where she fell in love with castles, kilts and brogues. I write fast-paced stories full of adventure, unique characters, mystery and suspense. I’ve published two novels with Kensington Publishing Corporation and have placed and won writing contests as both a published and unpublished author (ex. National Reader’s Choice finalist (published), RWA Golden Heart (finalist). I am a member of Mystery Writers of America and several national and local writing organizations. I’m a hydrogeologist by training with an M.S. in geological sciences and have taken additional engineering graduate coursework. I’ve taught at a university, worked on a project for the Air Force Flight Test Center, worked as a design engineer for a civil engineering firm, and have done computer modeling and field studies as a hydrogeologic consultant. I’ve studied in England and Italy, traveled to South Africa, Egypt, and South America, and still travel to places of interest all over the world so I can make my stories richer. i enjoy reading historical fiction set during the Salem witch trials. This series sounds fascinating! Thanks, Mariah. Julie and I have found historical Salem to be a fascinating place. It is also a well documented town as personal diaries and writings abound from the time period. The Peabody Essex museum is a great place to take in the history of both the witch trials and the seafaring years. You are so welcome! Happy Halloween! 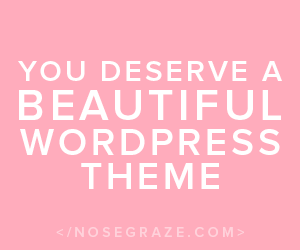 Melissa, I appreciate your having Julie and I on your blog. I’m looking forward to getting back to Salem sometime soon, as the Peabody Essex museum has some new facilities that will be open soon, and their displays on colonial maritime America are wonderful. My pleasure! I look forward to getting back to Salem myself…used to live there…haven’t visited in a few years. PEM is definitely calling my name too! ooooh… this series sounds fantastic! Congrats to Julie and thanks for sharing! Oh interesting! I don’t remember reading one with this setting/time frame. Sounds fantastic! Thanks ladies! I really don’t know much about the Salem Witch trials so these books would be educational as well as entertaining for me. I have not ever heard of this series before, but OMG! It is sooo going on my TBR RIGHT NOW! Thank you , ladies! It sounds great, doesn’t it? !